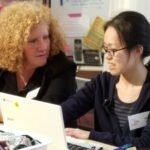 Maki has been a trainee with Yes She Can since she graduated from Manhattanville College in May 2016. 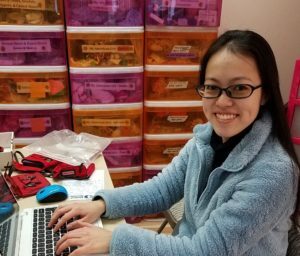 Maki wants to work in a position where she can put to use her research and data entry skills, and where her attention to detail can benefit the organization. During her participating in our training program, Maki has gained business skills and workplace behavior skills such as collaborating with peers, asking for assistance, working on less-preferred tasks, shifting from one priority to another as business needs change. Maki has learned about her strengths and her challenges. She also became a more confident self-advocate. Maki gained the essential skills she needs through her training with Yes She Can to be able to perform at her new job. My Employment at JCCA Westchester Campus, by Maki T.
I am currently working with ACCES-VR (the New York State vocational rehabilitation agency). I worked on resume building, cover letter writing, and interviewing skills with my vocational coach. In October 2017, I was fortunate to obtain an unpaid internship at the business office of JCCA Westchester Campus. After several months at my internship, I heard ACCES-VR would support converting it into a salaried position. I am assisting staff members with some of the administrative tasks. I am filing invoices and packing slips, organizing folders for company vendors, and doing inventory of deliveries. I am not only creating work orders and purchase orders, but also entering information of employees into the emergency notification system. I have knowledge about NetFacilities, Chrome River, and One Call Now. Some of my strengths are copying information directly from invoices to work orders and purchase orders. I believe I have been successful because I am supportive of my colleagues and supervisors. Through my experience, I am gaining a better understanding of working in the office environment. I am able to collaborate with staff members and apply my skills to the tasks. I enjoy having my own desk, computer, and printer. I am trying to work with minimal assistance from my colleagues and supervisors because I know they are not always available for me. I am compulsive about completing tasks at once, but I am learning not to put unnecessary pressure on myself. I have received positive feedback about working efficiently and meeting deadlines expeditiously. This internship has prepared me for employment. I am building relationships with staff members, developing more self-confidence, realizing my own capabilities, accepting new challenges, and beginning to establish new goals for myself. Lesli Cattan, Director of Training Programs, coaching Maki at Girl AGain. 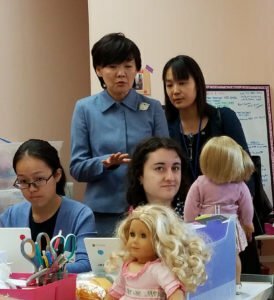 During a visit from Japan’s First Lady, Mrs. Abe, Maki (left) demonstrates how she adds data into the Girl AGain inventory management system.